Wikipedia explains what NaNoWriMo is. I’m excited and nervous to be writing this year. 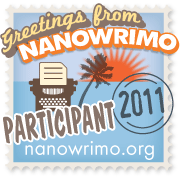 I’ll be NaNoing under my name, Juli Hoffman, if you want to buddy me. This will be my first attempt at a horror novel, so that should be fun stuff! Good Luck to Everyone NaNoing this Year!! !